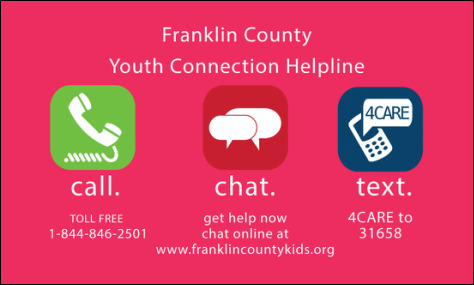 Franklin County youth, parents, and community members can call, chat, or text with someone 24/7 if they need assistance with getting services for children and youth ages birth to 19 years old. ​The FCCRB office is located on the top floor, Room 106. You must be let into the building, so please arrive no later than 5:20pm. The Franklin County Children and Families Community Resource Board is the administrator for the Putting Kids First: Community Children's Service Fund and the Franklin County Domestic Violence Fund. The funds are dedicated for services to citizens of Franklin County, Missouri, and will be awarded to local agencies to provide services that address the unmet needs of our community. We pledge to use these revenues wisely and prudently as we work with agencies and organizations to provide a myriad of services to benefit children, youth, and families.